I posted the completed squad the other day. 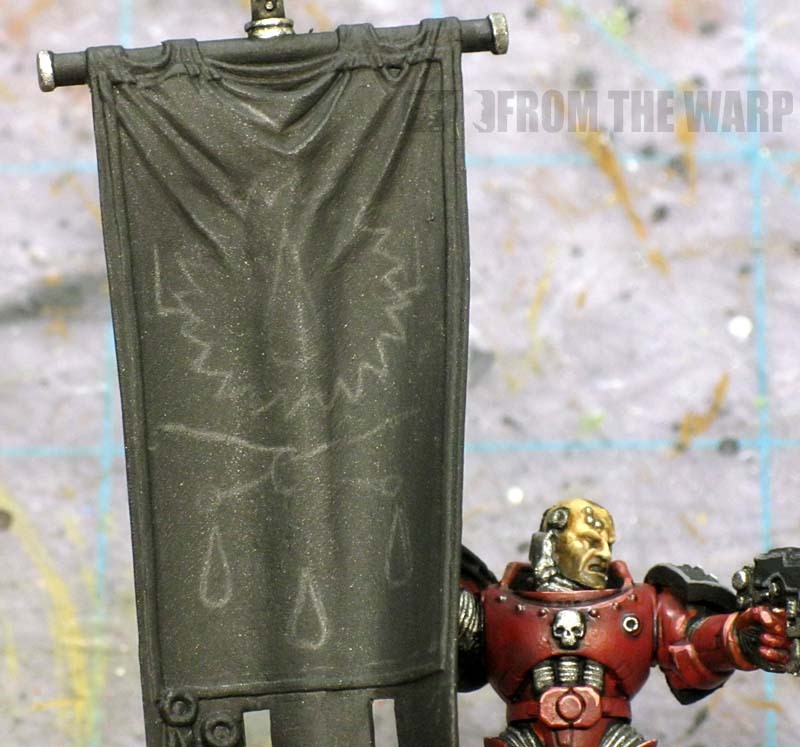 Now I'd like to go over how I painted the banner for the squad. It's a bit different than my usual approach using cardstock. Both have their merits, I'm just a bit more comfortable using the cardstock and can get some decent results that way. In this case, the plastic banner came with the project. I wasn't smart enough to leave it unattached to the model which is something I will definitely do next time. 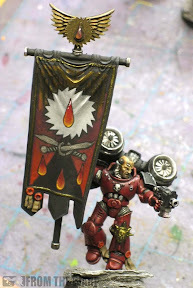 Paint the banner and the model separate and then glue the two together. Working on the banner while it's attached is just a giant pain in the backside and can be easily avoided. The first thing I needed to do was get the shape of the area I'd be working in. A few quick measurements and I was set. The actual space is not a true square as the top is a bit wider due to the flowing nature of the banner. But... this shape will get you close enough to the edge. Click on this picture for a slightly larger version. Save that to your desktop and then you can print it out. The scale is included there so you can make sure it is the correct size in the end. Once I had the outline, I actually enlarged the box a ton so that I had a nice big area to draw in. Then I go back and scale it down to the correct size before making the transfer to the model. This is liking working on a 3-up model where you can see all the details instead of trying to do it actual size. 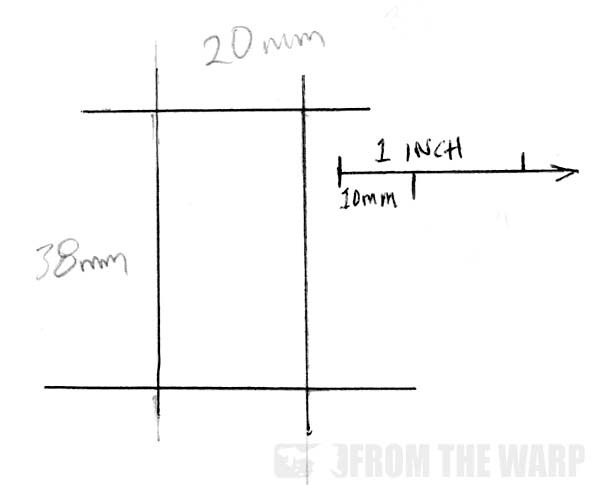 Once I have my drawing scaled back down to "real" size, I print out a few of them in case I make a mistake. Taking one of them, I flip it over and color on the back with a pencil so it has a fine layer of graphite on it. In effect, making it into a transfer. I then cut it out of the sheet of paper and position it on the plastic banner itself. Taking a fine tip ball point pen (a felt tip pen will not work since you need the pressure), I trace over the image to get it to transfer onto the banner. 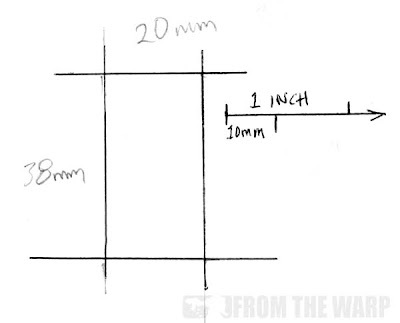 In the picture below, you can see what the piece looks like after it's been traced over with the pen. There's not too much detail you can get at this level using this approach. Most of the detail will be filled in as you paint. That is one of the drawbacks for me as I really like to have all the detail there in front of me when I start out. And here is what transferred over onto the banner. It's not much, but it's enough to get started. You need to be careful handling the banner so you don't smear the pencil away as you work too. The painting portion starts like I do with my models. Most of the time I work from back to front so that I can clean up the image as I go along and overlap elements. In this case, I started with the blade since I wanted to make sure I did not lose any of the teeth I had on there. Losing that detail would have been tough to make up later on. With the blade basecoat in place, I started my usual pattern and went to the Imperial Eagle in the background. You can see how rough it looks at this point. You can see how the Imperial Eagle takes shape as I go through the steps of adding the gold, adding a wash to the shaded areas and then adding a highlight. Each step refines the image a bit more than the previous one. With the eagle done, I moved back to the blade since it rests in front of it. i cleaned up my edges and then added my shading and highlights before working on the blood drop that rests on top of that. It's the same old pattern. Here's what it looks like after I've kept adding all my elements in order and have cleaned up the image as much as possible. In the end, it's not as polished as say one of my cardstock banners might be, but this one does have the nice organic feel of fabric to it that my cardstock banners lack. It's a trade off. 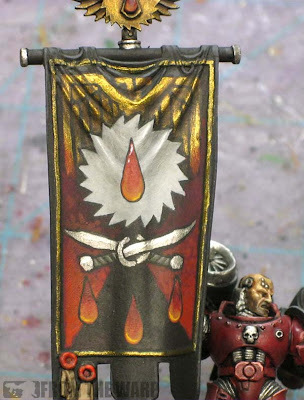 The whole thing is finished off with your regular highlighting and shading of the rest of the banner and the addition of any trinkets like purity seals and such. Never thought of pencil transfer to a plastic banner. Feeling slightly foolish now! Great tip and great results. Awesome- I need to keep this in mind for my Flesh Tearers as well! Very nice Ron. I'm definitely going to keep this in mind when I paint my Dark Angels banner. The Pirate Viking: It's a cheap trick almost like cheating... but it works. IDIC Beer: I'd say to try the cardstock method first as it allows you to get better detail and have a bit more control. This might be for when you're ready to paint on the fly and work your details in as you go along instead of having them all set out in front of you to start with. deathkorps: You can use just about any image, the idea of the transfer should still work without much trouble. Dugatron: Same for you. The image can change, it's the process that's the most helpful. Hopefully it works out for you. Where did you get the pre heresy jump pack from? Adam: They come from Chapterhouse Studios. The are the Pre-Heresy style jump packs. I think they look great on the models and would use them again in a heartbeat. This is a great help, thanks. 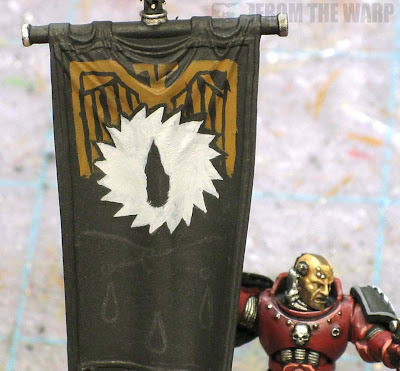 Isiah: Thanks, with a little more work, I can really get some detail into the banner doing it this way.